Call The Aerial Guys today on 01422 752035 for a no obligation estimate and to arrange an appointment. Are you looking for local TV aerial repair in Halifax? Do you a need professional satellite dish installation in Halifax or the surrounding areas? Then give The Aerial Guys a call. We are passionate about providing you with the best possible TV aerial and satellite service in Halifax. Contact us today on 01422 752035 to book an appointment. When you book a TV aerial installation in Halifax with The Aerial Guys we ensure an expert TV aerial engineer is on site that same day. Our friendly and professional engineers will assess your TV aerial installation requirements and give you a fixed price quote before they get to work. That way, you know exactly what you will pay upfront, with no hidden costs. All of our experienced aerial engineers carry a complete range of TV aerial equipment. So, when we say we can fit it that same day, we really mean it! At The Aerial Guys, we aim to deliver the most efficient installations and repairs possible, saving you time and money in the long-run. The Aerial Guys offer local TV aerial repairs in Halifax and aim to provide the best possible service. 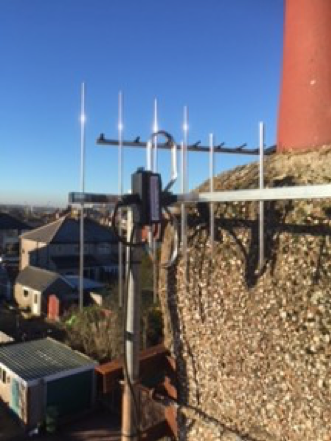 Our professional TV aerial engineers have been delivering quality TV aerial repairs to satisfied customers in the Halifax area for more than 25 years. In that time, we have encountered every aerial problem imaginable. So, you can count on The Aerial Guys’ experience and expertise. Whether you need TV aerial repairs, or you are planning to install a whole new TV setup, The Aerial Guys are always on standby, ready and waiting to provide the best possible aerial services in Halifax. Why not speak to one of our technical advisers today on 01422 752035 to find out how to arrange a visit from your local Halifax TV engineer. Has your satellite signal started to play up? Does your TV have a substandard picture? Then look no further, The Aerial Guys are experts in satellite dish installations in Halifax. If you need a complete satellite dish installation in Halifax, then our engineers can arrange the whole package – from fitting your satellite dish to configuring your set-top box and sorting out all associated wires and cabling. We are specialists in installing all the main satellite services, including Sky, Freesat and European satellite installations. Our professional engineers permanently carry a wide range of equipment and parts for all the main satellite brands, which means that we can usually assist with most issues when we visit you. At The Aerial Guys, our professional engineers are passionate about delivering efficient, courteous and tidy satellite dish repairs in Halifax. We have been delivering an exceptional service to satisfied customers across the Halifax region for more than 25 years. In that time, we have solved just about every satellite problem imaginable. 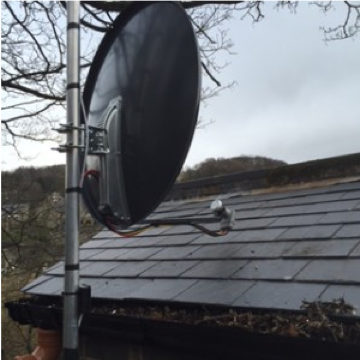 Our team of highly skilled professionals carry all the latest satellite equipment from all the major brands, which means that we can often deliver a same-day service including sky dish repairs in Halifax. At The Aerial Guys, we do not only deliver TV aerial and satellite dish installations in Halifax, we also provide an array of other specialist aerial services in Halifax and the surrounding areas. To learn more about Freesat and how to install Freesat in the Halifax area take a look at our helpful PDF – How to install Freesat Television in Halifax. 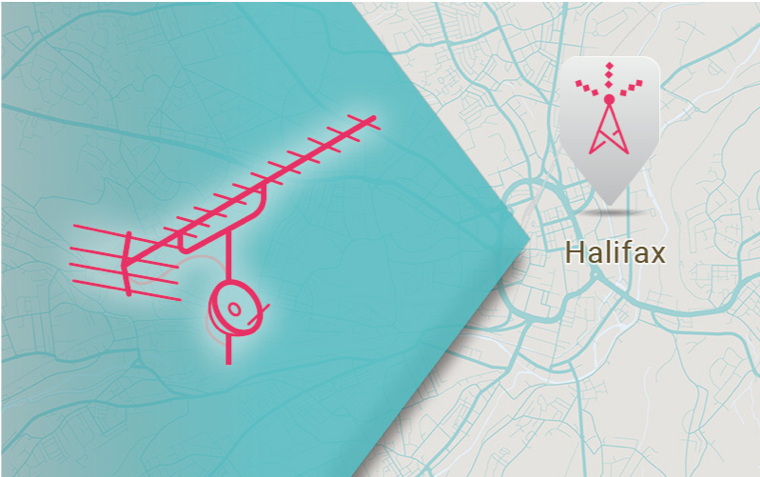 So, if you live in the Halifax area, and need local TV aerial or satellite installation services that truly deliver, speak to The Aerial Guys today on 01422 752035. “We are all students, so we share the cost of the satellite rental at our house. One of the lads is in charge of the contract but he’s never here, so when the system started to go wrong it was me who had to look for someone to get it fixed. I didn’t know where to start looking, as I’m not from Halifax itself. I found The Aerial Guys by accident and spoke to one of their technical people. They were really helpful and supportive,” Aisha says. The Aerial Guys located and solved Aisha’s satellite issue within the first 30 minutes. “He was great, really friendly. He helped to sort out the cabling too, which was in a real mess. The whole system is back up and running now. And the price was good – we can share it between us too which helps. Having the TV again means we can have our film nights again. Although it’s always a bit of a scramble to see who gets the best seat on the sofa! We’ll be raising a glass to The Aerial Guys tonight!” Aisha says.